Excellent Condo And A Great Area To Experience Destin, Fl! Amazing Balcony View! Come stay at the hottest resort in Destin, Fl! Not only will you have the best views in town but you will be above Harborwalk Village. Here you can find waterfront shopping, paddle board and kayak rentals, pontoon and jet ski rentals, parasailing, glass bottom boats, world class fishing, pirate ship excursions, dolphin cruises, clubs and nightlife, weekly fireworks, weekly Fat Tuesday parades, live entertainment, and an array of restaurants. Whether you want to have a drink at Margaritaville or take the family on one of the popular dolphin cruises, Emerald Grande offers you the ability to simply walk outside to access all of what Destin has to offer! Want to shop? Emerald Grande is just 5.7 miles away from the famous Destin Commons and 10 miles from Silver Sands Premium Outlets. 2 Pools (One indoor and one outdoor), 2 Hot Tubs, Spa, Sauna, Fitness Center that overlooks the pool and Gulf, Pool Bar, you are taken by boat to a private beach (the boat ride through the harbor is always a highlight). The resort is located just above Harborwalk Village that offers waterfront shopping and dining. Want to be pampered while on vacation. Visit the Emerald Grande Spa. Offers massages, facials, body treatments, wraps, masks, and spa parties. There is a sauna as well! 10562 Emerald Coast Pkwy W.
What are you waiting for??? It's time to book. Either send me a message or click on Book It Now! You won't regret it. I, Chris, will be the one you work with from booking to checking in to the follow up phone call to make sure you had a good time and to give you an invite back to stay with us again. You'll see why everyone always says they want to stay at The Emerald Grande one to check it off your bucket list! Bluewater Rentals LLC manages properties throughout Destin, Fl. We work with the top properties in Destin, Fl and Emerald Grande is the best! 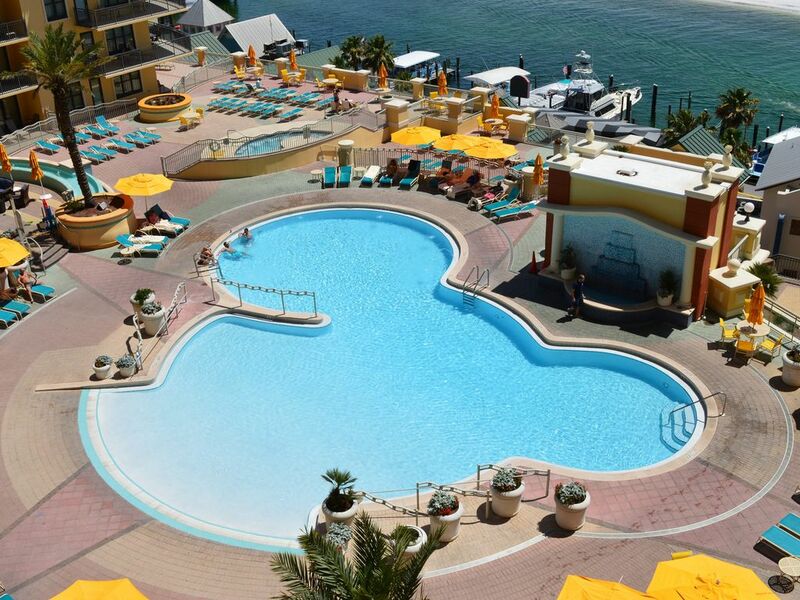 We know our guests will love this resort and we strive to have the same families staying with us year after year. Unparalleled views of Destin Harbor and the Gulf of Mexico. Zero entry pool with the best pool deck in Destin. Indoor heated pool for rainy days. A great workout room with everything you need to stay fit on vacation. Harborwalk Village is just below resorts so shops, restaurants, and water activities are just steps away! And the beach you are taken to by boat (most guests see dolphins during the ride over) is the best in Destin, Fl! Emerald Grande is the top resort in Destin. Emerald Grande is located just above Harborwalk Village! Emerald Grande is located on the corner where the Destin Harbor, Bay, & Gulf of Mexico meet. Emerald Grande sits on the corner of Destin Harbor, the Bay, & the Gulf of Mexico....creating a breathtaking view! Best Pool Deck in Destin! Best place to stay in the Florida panhandle. Wonderful condo in the best location in Destin Thank you for sharing your home with us. It rained a lot but we had plenty to do during downpours. Fireworks over the bay were amazing. Beautiful building and view. We'll definitely be back! A bit bummed towels and toiletries(toilet paper) were not refreshed daily. Friendly, convenient, and the room was super nice and spacious. This condo is beautiful!!! Not only was this condo beautiful, but it was also extremely clean. The beds were also very comfortable. We were upset that we had to leave early due to hurricane Michael, however we were refunded for the days we had to miss. Chris was very easy to work with. Great place (room) to spend time in Destin. The room, location, and view were great. Emerald Grande has almost everything you could ever want to do in Destin, FL just below the resort.